It’s four A.M., you’re in the midst of a bleary-eyed hoard of people dressed in super-thick red parkas and comically bulbous white boots. You’re being herded, like cattle, onto a giant military aircraft. In five hours your flight will be landing on a sheet of ice. The cargo door will open and you’ll be aware of the frigid temperatures, but that’s not what consumes your attention. The vastness, the Seussian landscape, the overbearing brightness of the sun are the things that try to wrestle your senses into submission, but your senses have no frame of reference from which to draw on so your experience becomes nearly incomprehensible. You’re in a helicopter, flying over what appears to be a topographical model of Mars. The ground below you hasn’t seen rain in millions of years. The aircraft lands; supplies and people are shuffled, the aircraft takes off again, repeating this ritual a few times before landing at a remote fuel station. While the helicopter is being refueled, you’re treated to fresh-out-of-the-oven cookies. You board the helicopter and depart for “home” – but you don’t go directly home. See, it’s early February and the sea ice is in full retreat. 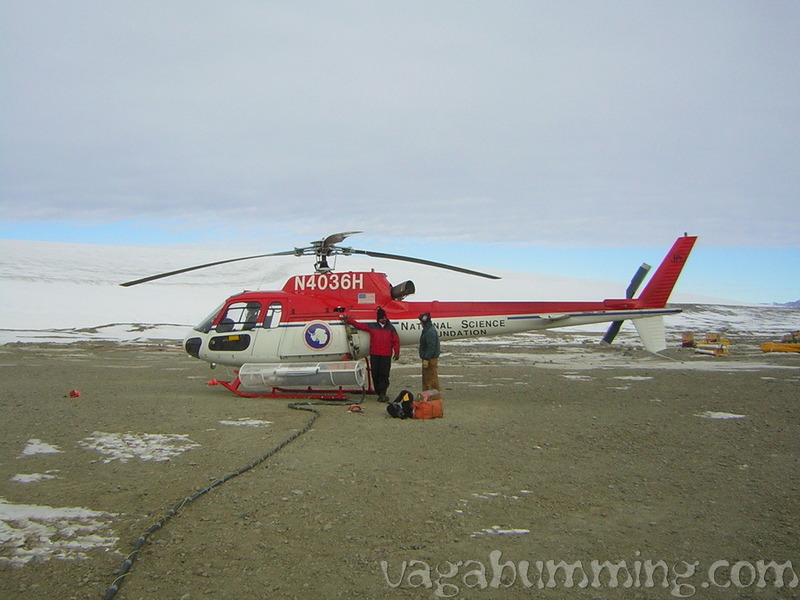 The helicopter hovers just over the very edge of the ice – where it meets open ocean. The point where ice meets water is teeming with wildlife; seals, penguins and orcas all feeding on krill. You don’t know it now, but in a few years, you’ll get to experience what krill tastes like when it’s served at a celebratory mid-winter meal. Through the headphones built into your flight helmet, the pilot’s muffled voice says something, but you’re too immersed in the experience to hear it or really even care what is being said. You board a ship at the southern tip of Chile. For the next 11 days you will be sailing to Antarctica. Several days into the cruise, the ship sails into the caldera of a volcano. A volcano – you’re sailing INSIDE a volcano! You’ll go ashore aboard a rubber boat. On the beach, you dig a pit that rapidly fills up with geothermally heated water. As the impromptu hot tub becomes too hot for comfort, you dig a trench to allow cold water from the ocean to mix with the hot water, creating a pool of absolute bliss. 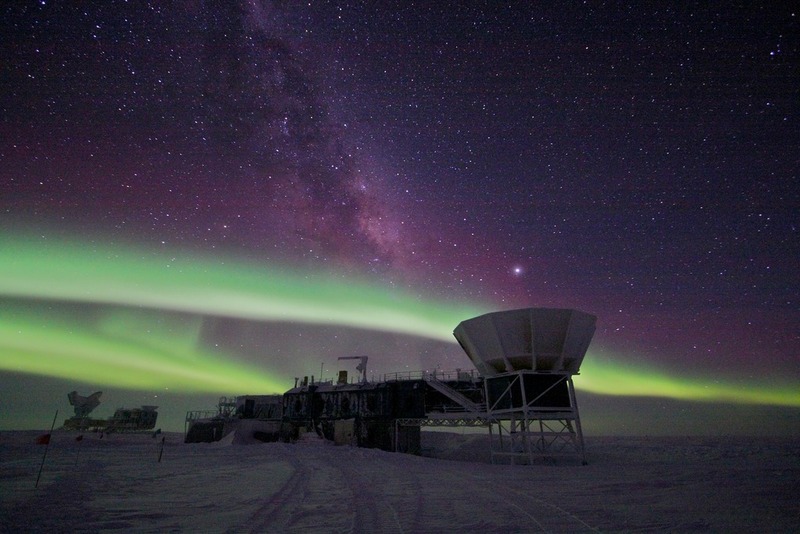 A few days later, the ship enters the Neumayer channel. The surrounding landscape is so pristine that it appears as if it were a painting. Nothing this beautiful could be real, could it? You’re road-tripping from Colorado to Utah with nine people you met only a week ago. You’ll go on a sunrise hike to Delicate Arch in Arches National Park. You’ll commiserate with your new friends about the absurdity of Utah’s liquor laws. You eventually find yourself combing the desert for clues which will help you find a “lost” doll. In this unlikely desert environment you are training for search and rescue in Antarctica. You’d like to believe that you have now seen the pinnacle of absurdity, but you know better. On your way back to Colorado you stop at a roadside diner where you meet an ex-con turned artist who is so open and interesting that you will always remember him and his story has become irreversibly enmeshed with your story. Job satisfaction is attained when you are 40 miles away from town and the ambient temperature is 40 below. Your behemoth tracked vehicle breaks down , stranding you; your mind is the only resource available to get you out of this situation. The difficulty of each task is magnified by whiteout conditions, windchills exceeding 70 below and only a couple of hours of daylight. Though it takes three days, there is no describing the feeling you have when you manage to get yourself out of this mess with no external support. You now have a new yardstick with which to measure possibilities and you can’t imagine how grave a situation would have to be for you to think of it as impossible. You see seas as smooth as glass and a landscape that looks like it was colored by an eight-year-old girl*. You and your friends are going to enjoy a day of boating. You’re surrounded by icebergs that are bathed in a hue of blue that is absolutely indescribable and unimaginable. A blue so deep, pure and bright that your eyes try to refuse that you are seeing it. 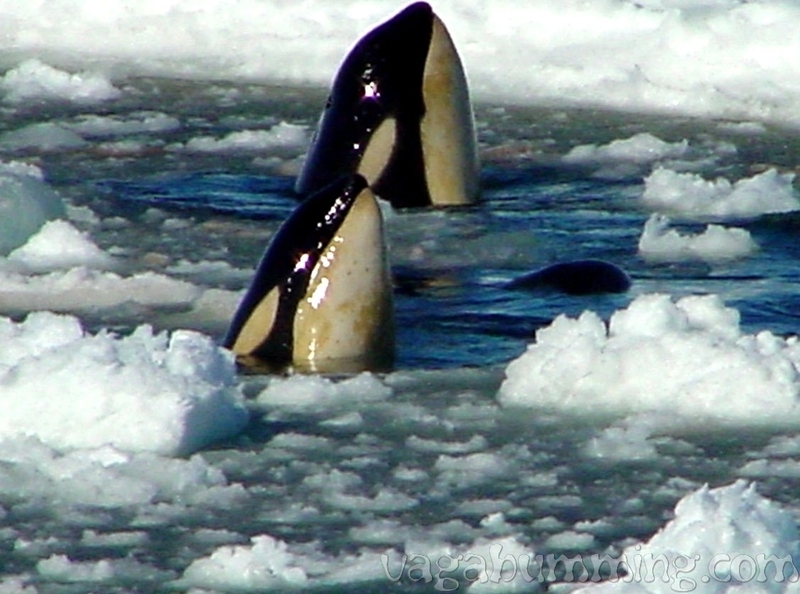 Penguins are porpoising beside your boat and in the water you witness the serpentine grace of a leopard seal. The sea ice has set up in places, and at times you think that all forward progress will been halted by it, but alas you get through and around the next bend you’re confronted with another vista of infinite beauty. You step outside on your way to work. The temperature is an inconceivable 80 below. 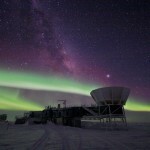 Your first thought might be that you need to expedite moving between buildings – but then you see it – the sky above is lit up with colors not of this earth. The lights dance against a backdrop of stars so thick that if it were called the “creamy way” that still wouldn’t be descriptive enough. The temperature isn’t even noticeable as you’re mesmerized by the light show above. You realize that this is what the sky will look like for several more months. Imagine that your circle of friends includes several people who have terrain features named after them or who have summited Everest (and other notable peaks) multiple times, though these people certainly aren’t boastful of their accomplishments. Imagine that one of the best meals you’ve ever eaten was prepared in a tent, 800 miles from running water. 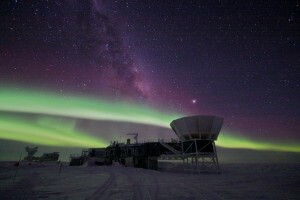 Imagine that you’re one of a handful of people who has seen the once-per-year sunrise at The South Pole. All of these things that you’ve experienced are part of your job! These things are only a minuscule part of working in Antarctica, but over time these threads are woven into the fabric of fond memories and revered experiences. 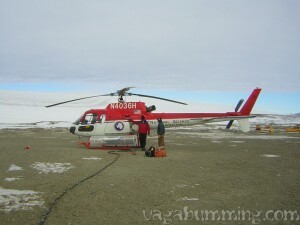 Most of the time, working in Antarctica is drudgery, pure and simple. We have hellishly arduous conference calls, awful fluorescent lighting, a never-ending mountain of bureaucratic red tape and ineptitude, budget struggles and a vast array of nonsensical corporate rules, as well as many of the other things that people deal with in their jobs each and every day. We have all of that AND we have the problems created by extreme weather; and we have to wash dishes and scrub toilets, yet all who come, and especially those who return, do so because the experience, as a whole, surpasses imagination. I’m often asked why I keep coming back – the short answer is usually something along the lines of “If you have to ask, you wouldn’t understand” – but when I actually stop and think about how privileged I am to get to do some of these things I realize just how badass it is to work in Antarctica. …Properly called a Nodwell. It’s a 1982 model of a tracked vehicle manufactured my Canadian Foremost. 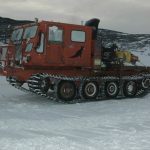 I am to drive this calamitous contraption 60 miles across the Ross Ice Shelf from McMurdo Station to Black Island Antarctica. I’m a heavy equipment mechanic tasked with repairing the two generators at Black Island that are down. There are other problems with other systems on the station also. Six other people will be going on the traverse (any overland trip here is referred to as a traverse) with me. We are taking a total of four vehicles. Three of them being Pisten Bullys and the fourth being the aforementioned Nodwell. 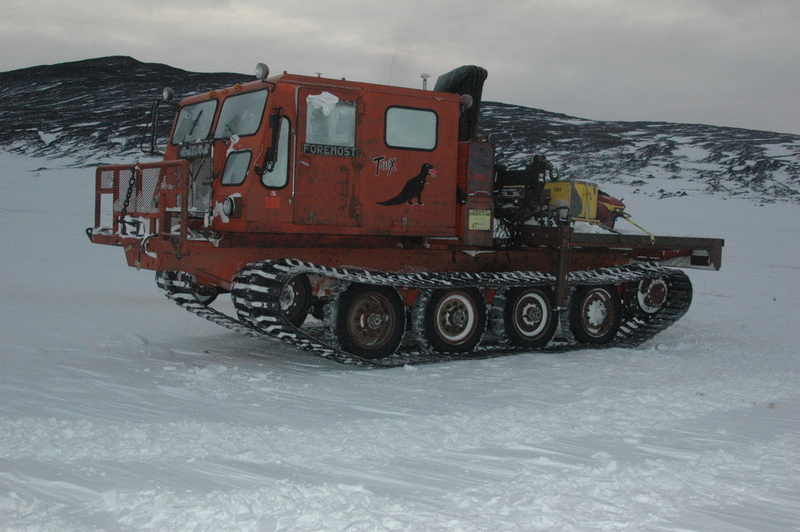 The Nodwell was brought into the United States Antarctic Program back in the days when each piece of equipment had a unique name. The Nodwell’s name is T-Rex. Pisten Bully is a German made ski groomer type of vehicle. It’s name is a reference to the French/Italian term “piste”. 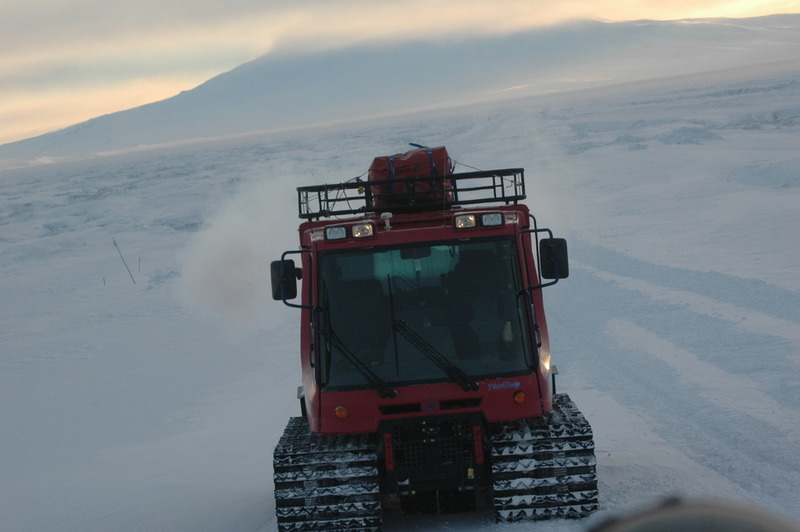 The Pisten Bully is a great vehicle for its intended purpose but that purpose wasn’t to transport scientists and equipment across Antarctica. Despite the snow and ice, this place isn’t Squaw Valley. Black Island gets its name because it is mostly snow and ice free. The katabolic winds here are treacherous and Black Island bears the brunt of their force, scrubbing the island clean of any accumulated snow and ice. The plan was to leave on Monday at 7:15 AM. But high winds in the forecast caused a 24 hour delay to our trip. This worked in my favor as I have a great deal of tasking on my plate and really need to get it done. During the delay our manifest increased by three people as a film crew wishes to go along for the ride. On Tuesday I checked my email at 6:15 to see if we were a go. An email outage prevented anyone from being notified so everyone prepared for going. For my part, this involves starting T-Rex which is no small task considering there isn’t indoor parking for vehicles. Think about how hard it is to start your car when it’s cold outside and multiply that by ten. 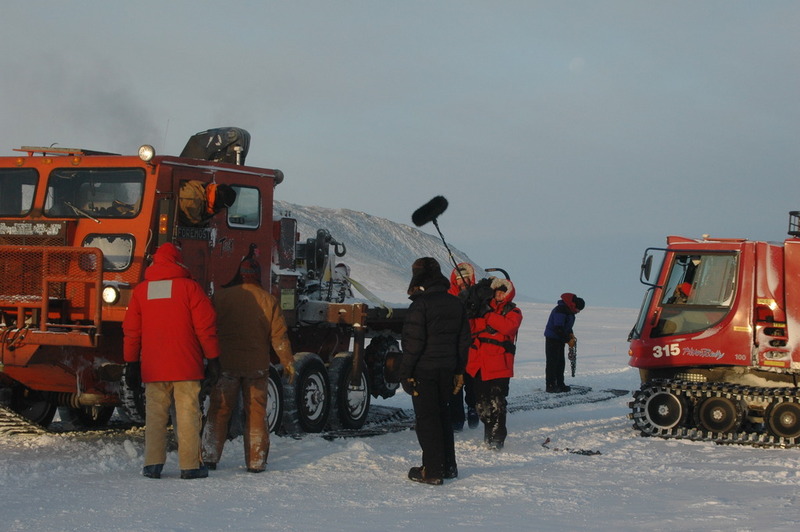 The temperatures are colder, the wind is fiercer and the equipment is older. I also had to load a few “do not freeze” items on T-Rex and gather my personal belongings for the trip. After the preparation I went to the dining facility for breakfast. It was there that I eventually found out that the traverse was postponed another 24 hours. I wondered how Shackleton, Scott and Amundsen were able to do what the did without the benefit of weather forecasters and email. By Tuesday evening our manifest had grown by another person. This time a cook and friend of mine from former trips into the Antarctic hinterlands. It was a relief to know that I wouldn’t have to rely on boil-in-the-bag type backpacker food. As the day went on, I realized that my luggage for the trip was getting heavier as I kept thinking of items that might be good to have along. As time would soon tell, this was a good thing. As I was looking down at the ice, I replied “That thing that I step on to get in and out is gone” The thing that I was referring to was the left side track. It had broken and was laying about 50 feet behind us. “What do we do now?” I thought to myself hopelessly. Dave and I were under great pressure to get this right. It didn’t take long for the film crew to get set up and start filming. The decision making process went into full swing with Dave and myself not wasting any time conferring about what to do or how to do it but rather fiercely attacking the problem at hand. I was able to back T-Rex up mostly straight onto its own track. We used one of the Pisten Bullys to pull the track sideways ever so slightly as I backed T-Rex up. Next, we had to get the other half of the track over top of the drive assembly. We put a few of the grousers over the drive sprocket and engaged the transmission of the machine and it pulled its own track over. That maneuver concluded the easy part. In order to complete the repairs, we would have to come up with material to mend the break and we would need to get enough slack in the track to bolt the two ends together. Fortunately for us, the break had happened in a previous patch. We could simply remove both halves of the patch and use the longer piece to go back in place and bolt less of it to the existing track. T-Rex has an air compressor and I was well equipped to deal with any situation. I got an air impact wrench and an air hose from my tool kit and spent a good bit of time unbolting six track grousers. That done, we only had to figure out how best to re-use the old section of track patch and get slack in the track. The track is tensioned by a cylinder packed with grease. Dave and I are both experienced mechanics. By experienced, I mean that we both know the consequences of removing a fitting that has grease under pressure behind it and neither of us was willing to take a face-full of frozen, pressurized grease. We also had no way of putting grease back in the cylinder once the pressure was off. 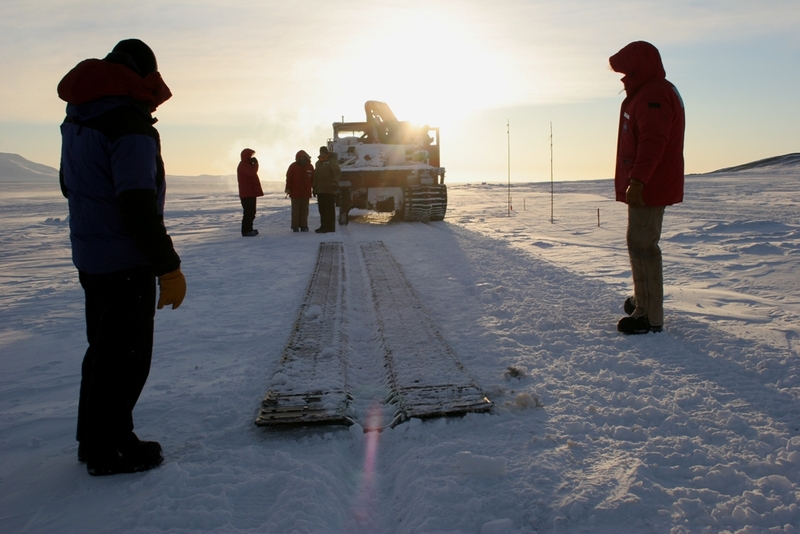 It was getting late and dark and the decision was made for us to ride in the Pisten Bully back to camp, get some rest and come up with a plan to finish the repairs to T-Rex.